As with a few other sites that I manage, the subscriber option has not worked the way it was intended. Additionally, there are many who have subscribed only to hammer away at the site to see if they might break in and spam the whole thing to death. That said, I regret that I must shut down the subscriber option for now. If you wish to receive updates you can contact me directly and I will put your e-mail address on a secret list and blind-courtesy-copy you each time something new happens. I apologize for any inconvenience. 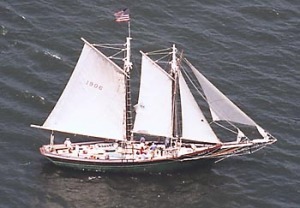 So recently I was permitted to volunteer aboard the gaff-rigged schooner Mary E as she sails out of Essex, CT. Periodically Captain Dan sends me a text and off I go after my day job is done; the crew have been very patient and gracious with me as I try to gain some first-hand experience of what being a ship hand sailing the CT must have been like. While I juggle other projects and aspect of life, slowing down the writing process for this book, things like being something of an honourary crewmember really helps to bring my mind back to the big project! The crew are also inspirational, teaching me things about the culture of the river that I simply had no way of knowing otherwise. I find myself to be deeply grateful to them all, captain and crew. I have posted a bit more about some of the crewmembers, prompted by a realization that I am overwhelmed with the various plans for the greater project and it is necessary to get some of the information out. Genealogical requests prod me towards this! I hope that what I post is of some help in these cases. PLEASE contact me to open conversation about these men, especially if you are copying the information I have posted! Just “leave a reply”. Capt. Moses’ biography is getting closer… New information had come to light which, while not changing what I had, did provided more insight to his life and to that of his family. With everything else I’m juggling, it is difficult to devote time to getting this thing done and to then find a publisher, but I promise that it is moving forward. I was recently contacted privately regarding some information regarding the Connecticut for clarification; I will post some of these points here. ■The only “official” vessel of war during the RevWar named the Connecticut that I am aware of was a gondola (effectively a gunboat) built at Skenesborough, NY, in 1776 specifically for service in Lake Champlain. She was built not for a “navy” but for the Continental Army, here commanded by Army Captain Grant and was attached to General Benedict Arnold’s command. While she did see combat during the “Battle of Valcour Island” (11-13 Oct, 1776) which delayed the British advance down the Hudson towards NYC, aiding in the American success at Saratoga (17 Oct. 1777), she was never a warship and never a “United States” vessel, our country not yet the United States but a Continental Confederation. 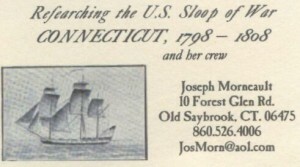 Nor was she named “USS Connecticut“, so later applications of her being the “first US” vessel named Connecticut is misleading and, in my sincere opinion, inaccurate. This vessel (gondola) was burned on the last day of the battle to prevent capture. ■The USS Connecticut was built under the contract of Seth Overton of Chatham, and he in turn hired Philip Gildersleeve and John Button, both also of Chatham, as sub-contractors to build the vessel and oversee the work. Both these latter gentlemen lived on Shipyard Lane; this street is now known as Indian Hill Avenue and is located on the north end of Portland along the Connecticut River. The river curves in there and the north side of Shipyard Lane (Indian Hill Avenue) was covered in private shipyards. Seth Overton hired the end-most shipyard for the construction – Stevenson’s shipyard – in part because Mr. Stevenson also had a modest ironworks, necessary for the building of the ship. The houses of Philip Gildersleeve, John Button, and Mr. Stevenson remain standing along the south side of Indian Hill Avenue today, and the shipyard is currently a privately owned vacant lot rolling down to the water. The area was not known as “Gildersleeve’s Landing” until many years later, as one of the sons of Philip Gildersleeve – Silvester – opened a rather successful shipyard which was located at the current spot of Petzold’s Marine Center… Not exactly on the spot the Connecticut had been built upon, but a stone’s throw away! Chatham was a large township, with Portland having separated as its own town in the 1840s, leaving the other villages of Chatham to later separate into such towns as East Hampton, Middle Haddam, &c; although I might add that these villages are often named in contemporary correspondance rather than referring to Chatham as a whole… Seth Overton always referred to his living in Chatham and his houses are in modern day Portland. Seth Jr. removed to the eastern portion of Chatham, first East Hampton and then Marlborough, where he is buried nearby the town library. I often find references to “Middle Haddam” in letters from the 1790s and 1800s, although it was indeed a part of Chatham. 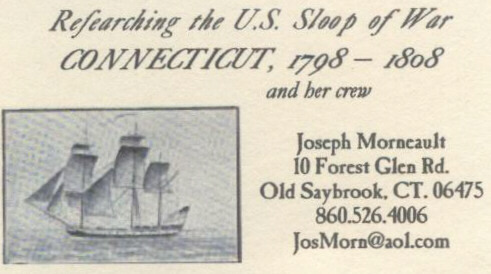 I began this project in 1990 – researching the story of the US sloop of war Connecticut and her crew. A book is in process but I plan to share a few things along the way through this medium. This also provides a method for those interested in the story to contact me. I cannot release too much pending the book, but I can give you some information should you inquire. I am also researching as much detail about the various crewmembers and others closely associated with the story of this vessel; I have the intention to put together and publish a biography for each person I can collect sufficient information to makeit worthwhile. Check back from time to time to see who I add to the list of those I have enough data to even mention! I have very good detail regarding the vessel’s Navy career during the Quasi-War between the US and France. When this conflict – a sort-of “police action” – was concluded, Congress elected to dramatically downsize the new Navy, selling off about a third of the vessels, “mothballing” or putting in “ordinary” another set, but keeping many of the vessels that were destined to become famous in part from the Tripolitan war but more so from the War of 1812. The Connecticut was one of those sold off in NY to the merchant service, and I have carefully traced her path until the end in 1808. Developing a sense of the importance of the men who served in her, be they naval or merchant marine, I have accumulated a great deal of data regarding them as well, keeping in touch with the descendants of a few, and generally trying to acquaint those who are related to the individuals involved with their ancestors. I also try to determin the final resting places of these men as closely as possible, in some cases impossible, to honour them by including photos of their headstones in their files and, once completed, installing copies of their bios with the local historical societies. This has been a very involved project, far more detailed than I had expected when I took it on. There have been some extremely helpful and interested people who have helped the project along, becoming directly involved, in some cases, for specific portions of the project. They will certainly be mentioned in the grand book regarding the vessel and in the biographies as each are assembled and printed. I am so very grateful for their help and encouragement!